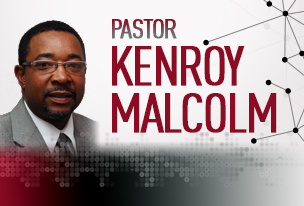 Kenroy Malcom is the Senior Pastor at Brockton Seventh-Day Adventist Church. Kenroy Malcolm was born and reared in a SDA home in the rustic hillside of St. Mary, Jamaica.. Ken married his wife Yvonnie on July 24th, 1988. This union produced two beautiful girls, Jessica and Kenisha . Educated at Andrews University ( MBA, 1997 & MDiv, 1995), Northern Caribbean University, formerly West Indies College. (BA in Theology,1982)..
Greetings and welcome to the Brockton/Oak St. Seventh day Adventist Church. We are a multicultural church family dedicated to proclaim the everlasting gospel to every nationality and language group. Jesus Christ is the reason for our existence and the focus of all we do. The Bible is the source of his self-revelation and by understanding it we find peace. In a world of Disconnect, Doubt, and Despair, we seek to be a place to Belong, Believe, and Become. I am very confident that the love of God and warm hospitality of our family will convey the presence of the Holy Spirit in our worship experience. If there is a longing in your life for something more, we invite you to contact us or come and worship with us. We will be happy to share what we have found in Jesus.